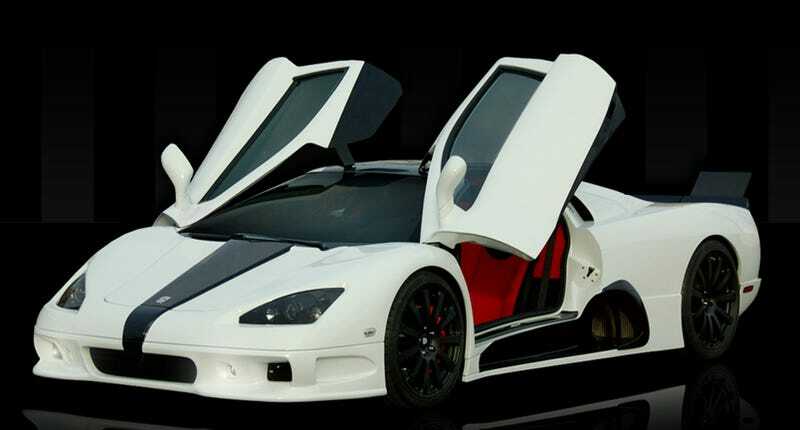 The 2009 SSC Ultimate Aero hopes to maintain the record for fastest production car with a claimed top speed of 270 MPH from the revised super car. Shelby Supercars already has the fastest production car record with its SSC Ultimate Aero TT, capable of traveling with an average top speed record of 255 MPH. How does the new Ultimate Aero raise the car to 270 MPH? The 6.4-Liter twin-turbo V8 in the SSC has seen its power pumped up 15% to a gravity-reversing 1,287 HP. This was done with the addition of a one-piece billet aluminum engine block. Because stopping a car going over 250 MPH takes some time, the vehicle now has an AeroBrake to slow the vehicle down. Additional changes include a slightly revised nose designed to keep the car more stable at the new, higher speeds. The interior of the SSC was also redesigned though, when you're going 270 MPH, we imagine you're not looking anywhere but straight ahead. Full details in the press release below. SSC to boost the power output to 1287 horsepower while improving durability. braking and downforce assistance are not necessary. dash prominently displays sleek, exposed carbon fiber dash halves and inset air vents. of a PC and processes SSC's onboard diagnostic software.